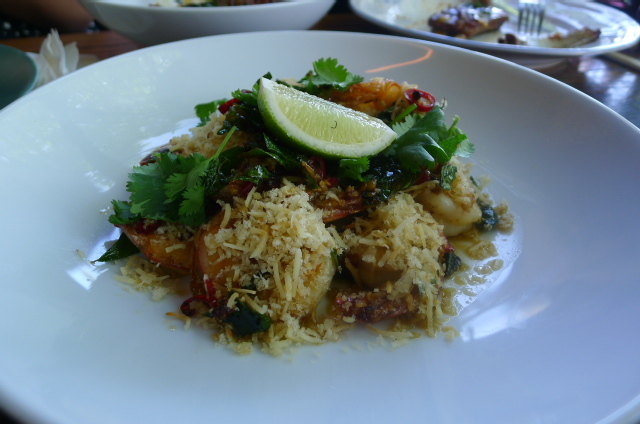 All funky Sydney foodistas seem to looove Ms. G’s, a quirky, offbeat ‘Westernised’ fusion Asian restaurant located in Sydney’s pulsating Potts Point/Kings Cross area. 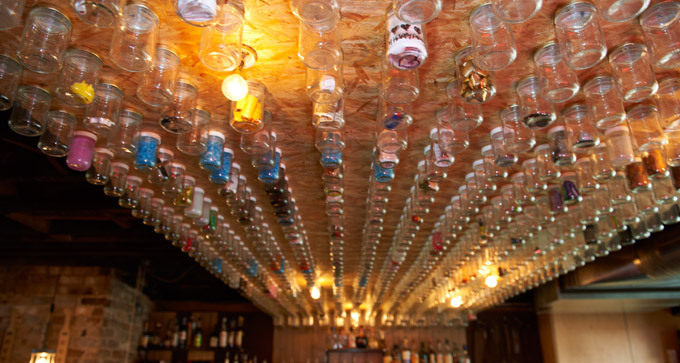 Its décor is unconventional to say the least – a neon door out front, buckets hung from ropes, a graffitied wall, communal tables – all laid out over an impressive four floors of eating space. Its approach to dining is that it should be fun – take the bubble-tea cocktails on the menu, a twist on the bubble-tea ‘teas’ made famous by the Taiwanese. And that’s before we even hit its famed signature dessert of ‘Stoner’s delight’, where the secret ingredient for the dish was ‘the mind of a stoner’. If there were there two things that were also going to guarantee Ms. G’s success, one would be that the Merivale Group is its owner, the multi-million dollar Australian hospitality business with the Midas touch that seems to turn almost every one of its bar and restaurant openings into a major success story. The second is that David Chang’s Momofuku is the inspiration behind Ms. G’s. The story goes that chefs Dan Hong and Jowett Yu hosted David Chang at a dinner at their previous restaurant, Lotus, and from that gathering the idea for Ms. G’s was borne. And to further guarantee its success, the influential Sydney Morning Herald Good Food Guide has also awarded Ms. G’s a ‘One Hat’ out of a possible three from its restaurant rating system. The food takes its inspiration from various sources – Chinese, Vietnamese, Thai, etc. It’s a mixed bag. There is the usual à la carte selections, and in addition to this menu there is a four-course ‘banquet menu’ for $60 a head (about £39). For Sunday lunch this becomes even better value as it turns into a four-course ‘Tick the box’ menu for $45 (about £29), where we got to tick (choose) the dishes we wanted from each course. The result was a sharing menu of two starters, 2 small savoury dishes, 2 larger savoury dishes and one dessert. Enough food is then delivered for the number of heads at the table. (The prices in brackets below are the à la carte prices). 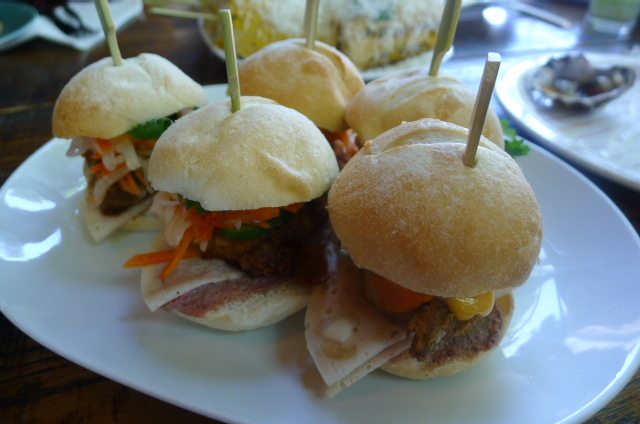 For our first starter, we ticked the Mini bánh mì ($6 about £3.90), a mini sandwich with crispy pork belly (there is also a chicken katsu option). The pork was tender, but there wasn’t enough of it to make this entirely satisfying. As is Vietnamese tradition, chicken liver pâté, cha lua (a Vietnamese pork sausage) and sriracha mayonnaise made up the remaining filling, all of which tasted decent, but was stingily sized. Ms. G’s grilled corn on the cob ($6 about £3.90) was delightfully good and I urge you to not past this up should you ever go to Ms. G’s. Grilled on a weber (a famous brand of Aussie BBQ), it was then topped with a sauce of cream, sour cream and togarashi (Japanese chilli powder), and then finished with melted parmesan, lime and coriander. 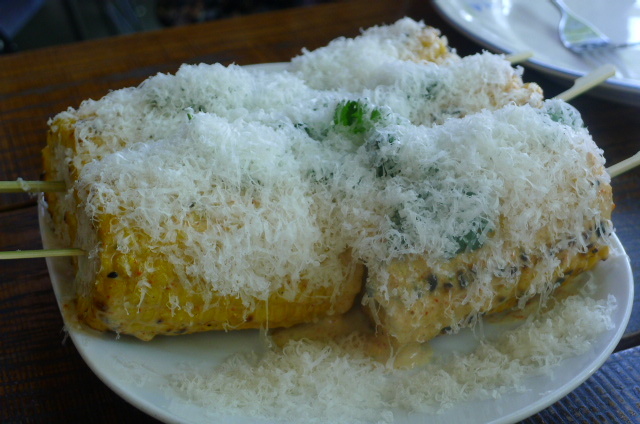 The combination of creamy goodness, gooey cheesiness, spicy chilli and zingy lime on the charred effect of the sweet corn was fantastic. 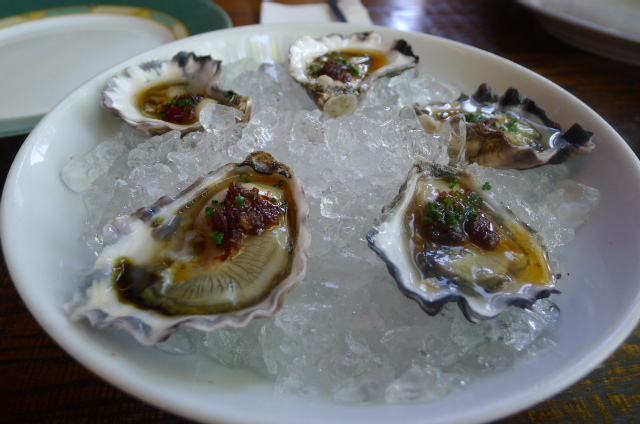 We also elected to have the third starter option of Sydney rock oysters with XO ponzu (at a supplement of $4 each). The oysters were fresh, but the XO ponzu sauce was a tad salty on the already mineral rich oyster. 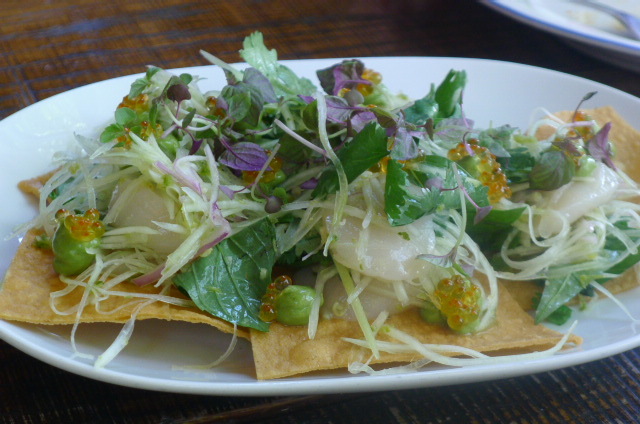 From the second course selection, some sea scallop tostadas ($16, about £10.40) with green papaya, guacamole and green nahm jim (a Thai chilli dressing) were lovely. The papaya was a good match for the fresh raw scallops, as was the very spicy nahm jim. The tostadas were crunchy and an interesting twist to the Asian flavours. 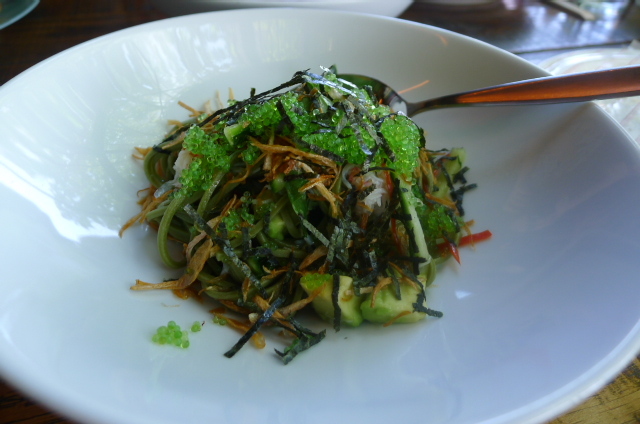 The noodles in a salad of green tea soba noodles with snow crab, avocado and shiso ($18, about £11.60) were well cooked. The crab was also lovely and sweet, but overall the salad was overwhelmed by the very salty dressing of white soy, ginger, garlic, sake and mirin. A dish of Malaysian butter prawns with the addition of curry leaf, chilli and lime (£28, about £18) was good, if a touch salty. The prawns were firm and sweet with a lovely flavour of butter. They had also been topped with a combination of crispy breadcrumbs and dehydrated coconut that added a fantastic crunchy bite. 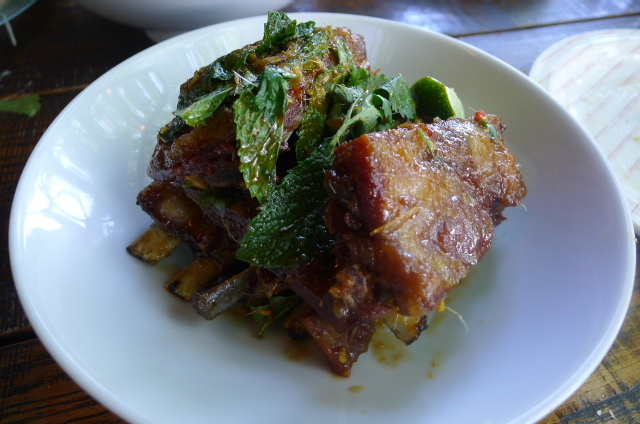 Jow’s sweet and sour lamb ribs dish ($23, about £14.80) is a signature at Ms. G’s and it’s easy to understand why. The lamb, slow cooked at 94 degrees for 13 hours is then browned and smothered with a sauce made with a caramelised sugar reduction, lemongrass, soy paste, coriander, chilli and cumin before serving. The result is very tender, meaty ribs backed by a sweet, rich, flavoursome sauce. 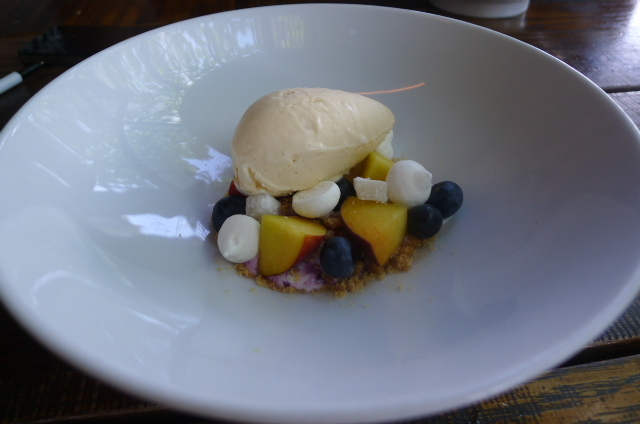 “So Berry Peachy” peach ice cream with blueberry yoghurt, streusel crunch, mocha and meringue ($12, about £7.70) was lovely. The streusel added a nice crunchiness to the dessert. The meringue was airy and fluffy. This was a refreshing and light way to finish the dessert. Westernised Asian food isn’t always my thing, but the food at Ms. G’s is really good. Some things were slightly off seasoning wise, but other than that, there were many things that one could easily enjoy. The service is chilled and relaxed as well. And apart from the good food, Ms G’s proved that it is great place for sharing, good value for money and hugely fun – a combination that is truly hard to beat. About $40 to $70 (about £26 to 45) for a starter, small dish, large dish and dessert per head. The banquet menu is $60 (about £39), and on Sundays the Tick The Box menu is available for £45 (about £29). Note: Exchange rates relevant at the time of this blog post.